Automobiles are an amazing feat of transportation yet we often take their reliability for granted. What happens when your daily driver is rendered immobile? Well that’s where Bowe’s Exxon Car Care Center can save your day. 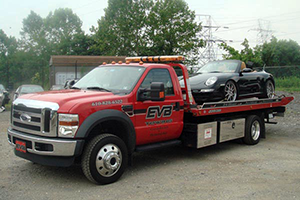 We not only offer expert auto maintenance and repair services by experienced technicians our sister company EVB towing harnesses the most powerful towing technology that allows the removal and transportation of vehicles of all sizes from point A to point B. We offer top quality customer care and unmatched response time. Relocating your vehicle has never been this easy. Cars frequently malfunction. They are made of hundreds of moving parts that are meant to work harmoniously to get you wherever you need to go. When your vehicle stops, don’t be left stranded on the side of the road. Whether you steer a roaring truck or a silent smartcar, reach out to Bowe’s Exxon Car Care Center and we will be there in a pinch to give you a lift. We are not an intimidating franchise or a shady auto shark – we are a friendly, locally acclaimed business with the goal of helping our clients and bettering our community. Call Bowe’s Exxon Car Care Center for all of your towing needs!